I like how the gun sits perfectly in the air. It's like your ghost keeps on sniping after the body is gone. We all die alone, burning, on the bare wooden floor of an arbitrary building. Ekos is the spy avenging my death. nice, my best sniper score on a regular server not insta spawn was 306. insta spawn i had 490. What's with the dumb scoreboard pictures? I want to see cool stuff happening, not boring numbers that I don't care about. Yet another heavy facial expression shot. 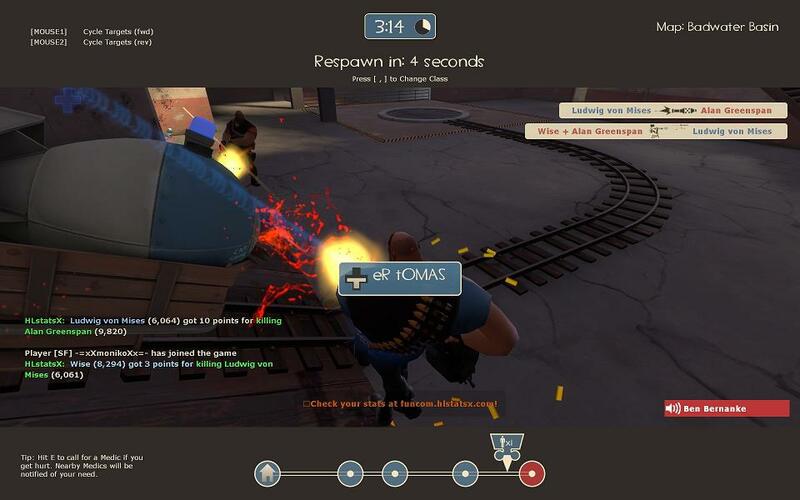 I was playing with my brother and we were dominating several people as heavy (my bro)/medic (me) at the time. some guy snagged a scout and went gunning for me, and after the 3rd or 4th time he finally got me down. this is the 'you just got killed by this guy' shot. How about a picture of Monkeyhero shoveling an ubered heavy's head? The shovel would have worked if that pesky medic hadn't shown up with an uber. rofl. i hate that ****. Revenge shot to the balls FTW.